A photo showing 20 women who were stripped naked following gunfight between Ugandan police and guardsmen of Kasese district, has been posted online. 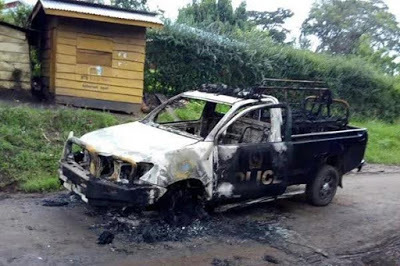 The chaos sparked off on Saturday morning when the Uganda People’s Defence Force (UPDF) and police attacked the Obusinga bwa Rwenzururu Kingdom, following the reports that the King was harboring militia fighting for the creation of an independent republic to stand on its own. On Sunday, November 27, at least 55 people were confirmed dead including the guards and police in the fierce gunfight clash. 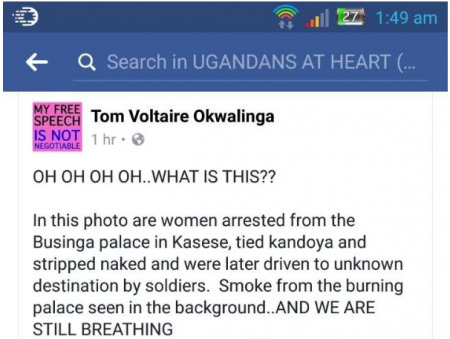 According to Tuko News, the women were reportedly captured from the palace and allegedly taken to an unknown destination by the Ugandan army.